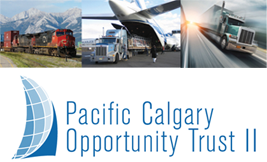 [January 2015] The Pacific Calgary Opportunity Trust II, an income trust created and managed by Pacific Investments and Development Ltd., has been fully subscribed. To receive notifications on future projects, please leave your contact information with us in the form at the bottom right of each page. Pacific Investments & Development Ltd. has an excellent track record on past investment offerings. Investors should be aware that past performance is not a guarantee of the financial performance of present and future investment opportunities. All Rights Reserved © 2019 Pacific Investments and Development Inc.